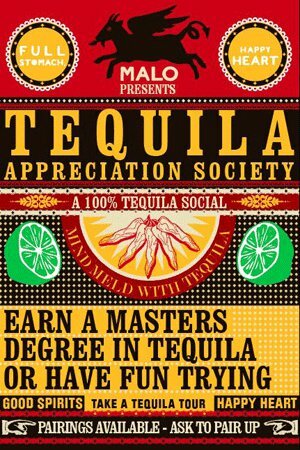 This Monday, April 5, Malo hosts Why Wait Till Mayo?, a “100% tequila social” presented by the Tequila Appreciation Society. Following on last summer’s successful Ultra Premium Tequila Tasting, guests will be able sample top notch tequilas, nibble on Malo’s tasty apps, and get their groove on in Malo’s upstairs event area. Making return appearances from last year are tequilas such as Casa Noble, Tequila Ocho, and Maestro Dobel. New brands participating this year include Corralejo, Cazadores, and El Jimador. The full list of tequilas and more details are below, including a discount code for presale tickets.